Delegates from the constituencies gathered at the Delegates’ Convention which was staged this time around in the Greek capital of Athens from 29 September to 4 October. 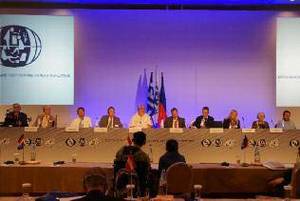 Athens was the venue of the 2014 Delegates’ Convention which was held from 29 September to 4 October. 36 Full Members, to which the entire Managing Board belonged, travelled to Greece to conduct necessary statutory business and discuss the articles of association. The schedule also included the opening of an international exhibition as well as various social events. Trevor C. Wells passed away on 13 September 2015. In Trevor Wells the Association has lost one of its most important artists. His landscape motifs were painted with extreme subtlety and detail, while the light influences were so vivid that many an observer mistook his paintings for photos. His pictures are still a major crowd puller today when they are shown at exhibitions. They come across as intelligible and real, which is precisely why they are so popular with a wide public. The same can be said of Trevor Wells as a person. 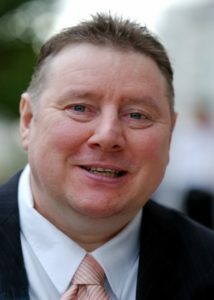 In his 15 years as a member of the Board of Directors of the Association, his honest and upright attitude was appreciated by all his colleagues. 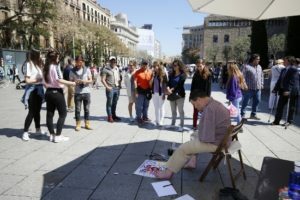 One hundred mouth and foot painters gathered in the Spanish city of Barcelona from 9 to 14 April 2017 to celebrate the 60th anniversary of the VDMFK. In addition, a General Assembly was held and members of the new Executive Board were elected at this celebration. 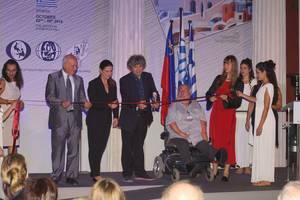 Members of the Association of Mouth and Foot Painting Artists have always elected their President and Board themselves, and they also decide on key strategic decisions of the VDMFK. The celebratory week began with an opening evening at which mouth and foot painters who had arrived from all over the world were welcomed. VDMFK President Mr Serge Maudet took the opportunity to greet the artists personally during this evening. On his behalf, but also on behalf of all members of the Board of Directors and of the Executive Board of the Association, he bid the artists a cordial welcome to the celebrations marking the 60th anniversary of the Association, which was created by Arnulf Erich Stegmann, and thanked them for attending. In his further remarks, he spoke of the values which the VDMFK family shares and espouses. He emphasised how pleased he was to celebrate this special event with the artists and to spend a convivial time with them. 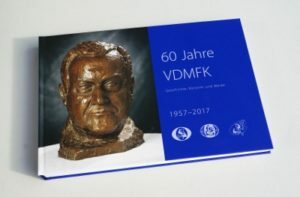 In addition, the new book “60 Years of the VDMFK – History, Artists and Pictures” was presented on Monday evening. Each Full Member and each Associate Member is introduced and presented on a separate page in this book. Furthermore, the decision was taken not to offer a detailed account of the Association’s history, but to let the pictures speak for themselves and to integrate them into the book in the form of a collage with captions. A focal point of the history also consists of the three former Presidents of the VDMFK. 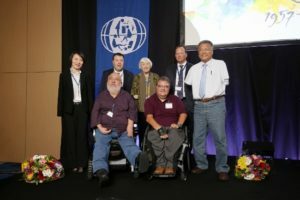 The contribution of Arnulf Erich Stegmann, Marlyse Tovae and Eros Bonamini, and their tireless efforts in developing the VDMFK for mouth and foot painters around the world, is highlighted in separate chapters. 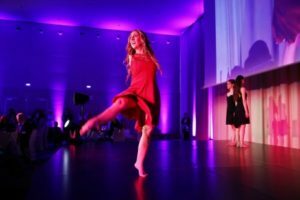 One of the highlights of the evening was the appearance of Full Member Ms Simona Atzori from Italy, who began her performance with a foot painting component which then merged seamlessly into a dance segment. During the General Assembly, the Full and Associate Members elected two new Board members. These new elections were necessary following the death of Board member Mr Trevor C. Wells and the retirement of Board member Prof Manuel Parreño. After several ballots, the Full and Associate Members elected Ms Soon-Yi Oh, a foot painter from South Korea, and Mr William Sharman, a mouth painter from New Zealand, onto the Board of the VDMFK. In addition, two highly deserving figures in the VDMFK stood for selection as Honorary Members: the long-serving publishing director Ms Roswitha Malsch from Italy and the outgoing Executive Board member Prof Manuel Parreño from Spain. The two were unanimously granted honorary membership status. The General Assembly was also used to boost the awareness of mouth and foot painting. With this in mind, artists went to the Sagrada Familia and to the Cathedral, where they carried out a painting demonstration. This event attracted a lot of attention from tourists and residents alike. A wonderful exhibition of works by mouth and foot painting artists was staged in the Museo Maritim de Barcelona, a venue full of history. 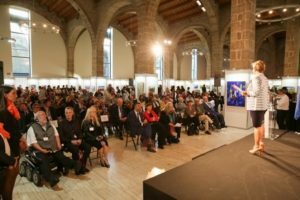 216 original paintings and two sculptures by 118 artists from 35 countries were presented at the show. Catalan Minister of Culture Mr Santi Vila Vicente delivered the official opening address. Honorary members included Ms Laia Ortiz, Deputy Mayor of Barcelona and Ms Maite Fandos, deputy of the City of Barcelona. The exhibition was held from 12 to 17 April 2017 and attracted the interest of thousands of visitors.